It’s that time of the week again to take a look at Creative Advertising Ideas! Time to get inspired with the latest advertisements around the globe. In this edition of Creative Advertising Ideas we are going to check out what happens when one tries to implement the idea of paperless household. Meet Old Spice’s newest marketing director. Play a neat board game about global warming. Show how and why are pets awesome. Take a look a some amazing women athletes and the reason why are projects amazing! The subject of climate change is a tough topic to tackle one specially when introducing it to kids. With this obstacle in mind GEOlino a science magazine for children in Germany created and their creative advertising ideas is Meltdown. 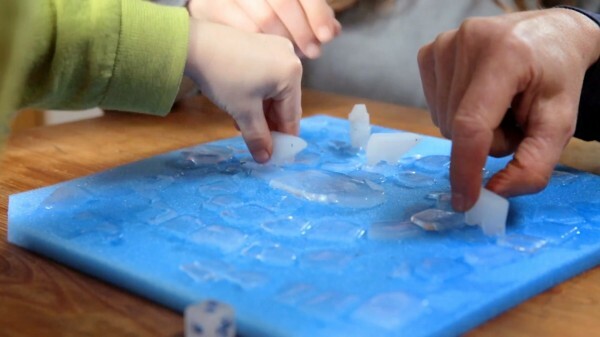 Meltdown is a board game where kids use a special ice tray that creates the ice pieces for the board game. The goal of the game is to get the polar bears to safety before the ice tiles melts. With the digital age coming in steadily, the use of paper for everyday tasks has slowly becoming obsolete or at least frowned upon. While we are not sure when exactly will the whole world go paperless, Le Trefle a French toilet paper wanted to prove that paper is still much needed. In Le Trefle’s latest tv spot entitled Emma set in a French household. They presented a tongue and cheek approach that paper is still very much relevant. SPCA is a Non-profit Malaysian animal welfare shelter that aims to help homeless, abused and unwanted animals. In their latest campaign, SPCA Malaysia wanted viewers that pet are much better at play rather than toys. Along with the help of M&C Saatchi, Kuala Lumpur they created this two-piece series illustrating that there is much more play with a pet than toys. Sports brand giant and Nike’s arch enemy, Adidas just recently unveiled a cross category brand direction. The campaign’s aim is to highlight the bond between women in sports. Featuring a wide variety of sports such as cycling, diving, boxing and football breaking the stereotypical view of how women bond. The campaign features real athletes in their environment with their peers while pushing themselves to the limit in order to achieve their goals. Personal projects are amazing. Not only you get to work with what you love, you also get to learn more and be better at something. This is why Australia based paint company, Inspiration Paint wants to stress out that they love and support your ideas. Even if your project is small or big, or as simple as repainting your door or a making a mural to decorate your wall. This recent print ad from Nigerian advertising agency, Noah’s Ark presents a simplistic yet direct approach to call for attention to put the West African industry in the advertising industry map. The agency released a two-piece print ad. The first one depicting different countries taming the Cannes lion and another one to represent being included in the Gunn Report. When it comes to really creative advertising ideas, Oldspice advertisements is something that everyone should look out for. From the much love hilarious viral videos of Old Spice Guy to the crazy antics of Terry Crews. These series of videos help put Old Spice in the map and thus earning the Internet’s must coveted trust. It their newest campaign, Old Spice introduces their new and highly efficient Marketing Director Mr. Wolfdog. How do you guys like this week’s Creative Advertising Ideas? Tell us which ads you like the most! We’d also like to hear your insights and if we missed something give us a beep at the comments section.